For the whole of this week I am delving into the world of carbon. and the low down on personal carbon allowances. The objective of the Koyoto Protocol is the "stabilization of greenhouse gas concentrations in the atmosphere at a level that would prevent dangerous anthropogenic interference with the climate system." 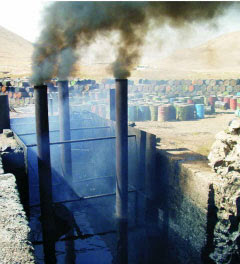 Countries that ratify this protocol commit to reduce their emissions of carbon dioxide and five other greenhouse gases (GHGs), or engage in emissions trading if they maintain or increase emissions of these gases. The treaty was negotiated in Kyoto, Japan in December 1997 and finally came into force on February 16, 2005 following ratification by Russia. There are now a total of 169 countries and other governmental entities that have ratified the agreement. Notable exceptions are the United States and Australia. Other countries, like India and China (developing countries, called Non-Annex 1 economies) which have ratified the protocol, are not required to reduce carbon emissions under the present agreement. * By 2008-2012, Annex 1 countries (developed economies) have to reduce their GHG emissions by an average of 5% below their 1990 levels (for many countries, such as the EU member states, this corresponds to some 15% below their expected GHG emissions in 2008). While the average emissions reduction is 5%, national targets range from 8% reductions for the European Union to a 10% emissions increase for Iceland. Reduction targets expire in 2013. * Any (developed) country that fails to meet its Kyoto target will be penalized by having its reduction targets decreased by 30% in the next period. * Kyoto includes "flexible mechanisms" which allow Annex 1 economies to meet their GHG targets by purchasing GHG emission reductions from elsewhere. These can be bought either from financial exchanges (such as the new EU Emissions Trading Scheme) or from projects which reduce emissions in non-Annex 1 economies under the Clean Development Mechanism (CDM). Some GHGs occur naturally in the atmosphere, while others result from human activities. Naturally occurring GHGs include water vapor, carbon dioxide, methane, nitrous oxide, and ozone. Certain human activities, however, add to the levels of most of these naturally occurring gases. Approximately 30 gases are produced by human activity which contribute to the greenhouse effect. 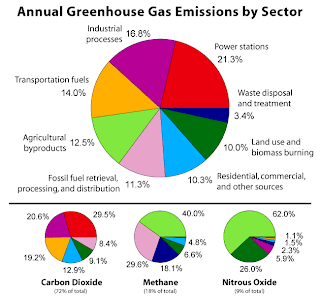 GHGs naturally blanket the earth but the recent increase in temperature is a result of the increase in the concentration of the main greenhouse gases, in particular those that are man-made. Atmospheric concentrations of CO2 are changing rapidly as we burn fossil fuels, clear forests, use gasoline-dependent transportation and heating systems and build with concrete. In particular, the amount of CO2 has increased by over 37% since pre-industrial times (from about 270 molecules of CO2 per million molecules of air in 1850 to the present 381 parts per million, now climbing higher and faster each year - currently by 2.5 ppm annually. To put this in context, prior to 1850 CO2 concentrations stayed between 260 and 280 ppm during the preceding 10,000 years). * After water vapour ,CO2 is the most prevalent greenhouse gas. * CO2 accounts for 80% of total greenhouse gas emissions. 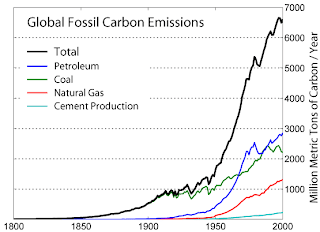 * The current global surplus of CO2 from carbon fuel burning is about 6 gigatonnes (billion tons) per year. I am studing a Masters in Environment and Development at King's College London, and for my dissertation research am carrying out a study for which I am recruiting voluntary participants. For my study I am researching aspects of the new carbon emission reduction scheme in London. I would like to interview people who have taken individual action to reduce their carbon footprint, to see if there are any correlations between people's occupation, gender or other cultural identity, and the nature of their environmental opinions and decisions. In addition to this, I will be examining any relations between these factors and people's access to information and resources, including media products, regarding the topic of carbon emissions and reductions. Volunteering will entail an interview lasting 20 to 30 minutes, and will consist of an informal interview based on the above research topic. I will be asking questions about any actions you have taken to reduce your 'carbon footprint', the main factors that may have influenced your decisions; including questions about consumption of media products, access to information and how these have influenced your decisions and opinions. This interview can be conducted over the telephone, or in person, at a location convenient to you. I understand that you may be slightly inconvenienced by my taking up half an hour of your time, however, it is also an opportunity for you to contribute to the research of a relatively new but significant aspect of positive environmental action in London. Just wanted to say I'm really proud of everything you're doing.